Tim Cook is a very different chap than his predecessor, in many ways from his business know-how to his education and manner of speech. We got more insight into all of these during his address at Goldman Sachs yesterday–including a long spiel and a Q&A session that gave us many more public Cook words to analyze. So what did he say? The most common (non-flller) word was “we” with 85 uses, a handful more if you include “we’re” and “we’ve”–a sign that Cook is very much steeped in the Apple team spirit, as other reports have hinted. “I” got 74 uses, since the speech was all about Cook’s own interpretation of fiscal matters. “Think” had 34 uses, spread around from “I think” to “you think” to “we think.” Clearly Cook is a thinker. You may interpret it as a sign of weakness, unconfidence…but he uses it to sketch ideas and personalize his speech. 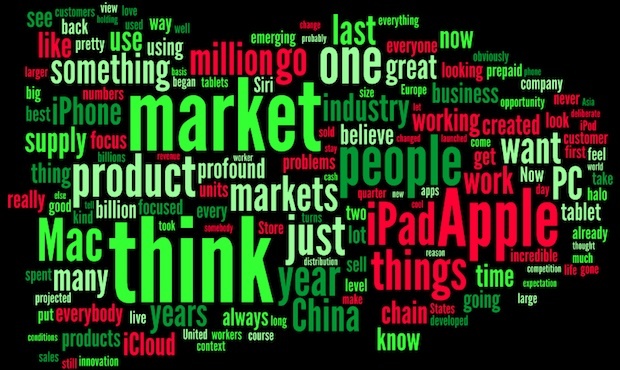 Sensitive to the importance of sales figures in front of the particular audience, Cook used the word “market” 29 times, more than he said “Apple” (23 times). And again, demonstrating both Apple’s team spirit and the headline-grabbing reports about working conditions in Apple’s Chinese supply chain, he said “people” 21 times (and China 13 times). Fascintatingly the words “business,” “innovation,” “customer,” and “industry” weren’t said much, and while he said “iPad” 17 times, iPhone just got 15 mentions and iPod only 4. Are we seeing hints of Cook’s interests here? Industry watchers will ponder that “TV” just got 2 mentions, always in the context of “Apple TV.” Tim is playing by the Apple book here, and not hinting at the hot rumored Apple television at all. All in all Cook seems to be a guy happier saying words like “profound” and “believe” than his former boss was with his “boom”s and “great”s.